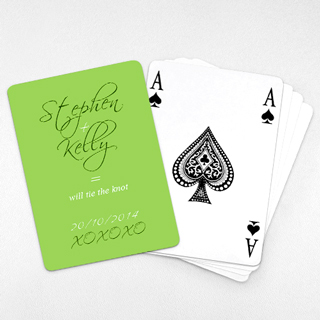 Send a extra unique and personalized save the date invitation by making your own custom wedding playing cards. Elegant and high quality making it the perfect choice of wedding favors. We offer standard smooth finishing and optional linen finishing. Custom-printed tuck box is available at reasonable pricing. It also makes an ideal choice of invitation card in non-orthodox format.